VENLAY Restorations inventor sees an uptick in global clients - along with a surge of copycat dental services trying to mimic his exclusive trademarked method. LOS ANGELES, CA, August 11, 2015 /24-7PressRelease/ -- An all-encompassing health care approach marks today's most progressive health care providers, says California's Dr. Sam Muslin, a proponent of non-invasive dentistry and the developer of Anti-aging Face Lift Dentistry . "You look your best when you feel your best," says Dr. Muslin, who has been featured in the Wall Street Journal and on The Doctors TV show. "Increasing interest reflects the changing face of today's consumer, who demands authentic and convenient health alternatives. Patients fly in from across the country and around the globe to get this exclusive treatment. They arrive with multiple health challenges as premature aging, worn down teeth and some tell me that jaw surgery and braces were the only choices they'd been given." Today's potential clients are interested in diagnostics and therapeutic options. They want to know what the outcome potential is before treatment is completed and you cannot do it with surgery or braces, explains Dr. Sam Muslin. "Dental professionals, who have changed with the times, recognize that the patient is more than just a mouth with teeth. Patients have done their research, and they want their youthful appearance back." Dr. Muslin's Santa Monica office works to improve patients' overall health, using meticulous health assessment, preventive applications, the latest equipment and materials - such as ultra-thin, patent-pending VENLAY restorations - and restorative dentistry to idealize the bite to the facial structures, reduce sleeping problems, increase breathing ability and to eliminate TMJ pain along with head and neck stress. "Face Lift Dentistry has revolutionized how we treat patients," says Dr. Muslin, who has been in the field of dentistry for more than 35 years. "It's a non-surgical, no-tooth grind, health-centric approach ushering in The New Age of Non-Invasive Dentistry." Patients, including those from Hollywood to mail carriers, nurses, doctors and business professionals are particularly interested in Dr. Muslin's practice because he offers non-invasive treatment for bite dysfunction that doesn't require the long-term commitment or the risk of jaw surgery and braces. In addition, Dr. Muslin will not grind down natural teeth when correcting the bite with his VENLAY Restorations. "Savvy baby boomers and millennials don't want braces, face lifts, injections, or their jaws broken," explains Dr. Muslin. "They don't want their teeth ground to nubs either. Consumers want timely relief and long-lasting health benefits. They want to be able to chew their food, sleep better look and feel attractive. This treatment is not just a 'smile lift' with veneers - something other cosmetic dentists advertise as 'age reversing dentistry.' Face Lift Dentistry is actually good for the health of the patient. It replaces worn tooth enamel, helps patients speak clearly, and addresses jaw pain. Yes, the cosmetic benefits are dramatically improved, but more importantly, the patient feels better physically and emotionally." During client consultation, Dr. Muslin evaluates face shape, speech, profile and bite mechanics, using complex motion tomography. He can actually see the most ideal jaw position for his patients. He checks for decay and irregular chewing. He studies the skin for wrinkles and loss of underlying support. Infection, gum disease and bone loss are addressed first, and then bite correction is implemented. Old fillings, mismatched veneers and crowns are replaced, using VENLAY Restorations on the healthy teeth to whiten and reshape natural teeth, support the jaw, and create a cohesive smile. "Anti-aging Face Lift Dentistry has transformed the lives of many people," says Dr. Muslin, who pioneered non-surgical bite and profile correction. "My clients can have their bad bites corrected, giving them a better profile and younger look without a scalpel in sight. Necklines and chins look better, headaches go away, and self-confidence improves." Consumers are so interested in Dr. Muslin's Face-lift Dentistry that his website (www.faceliftdentistry.com) scores more than 1,000 visitors each day. Clients' YouTube testimonials get tens of thousands of documented views. The demand is so high that Dr. Muslin has announced his new training for dentists at the Face Lift Dentistry Academy in Beverly Hills. Qualified dentists may register for consideration for this exclusive continuing education opportunity by filling out the online Face Lift Dentistry training contact form. With the Face Lift Dentistry method, bites are corrected three-dimensionally to maximize health while improving facial profiles, chin size, speech and smiles. Neck tension and stress from poor jaw position are reversed to address signs of premature aging: wrinkles, yellowed broken teeth, a sunken mouth, shortened upper teeth, and an inwardly collapsing face. VENLAY Restorations are used to build the teeth in all the right places to correct open bites, overbites and under bites. The treatment optimizes the proportions of the patient's face and chin by ideally positioning the lower jaw to coordinate with the patient's facial structures. To read more about Dr. Sam Muslin's dentistry and to see his most recent case study photos, that are untouched and unaltered, visit the Face Lift Dentistry website or his YouTube channel. For consultation, call (310) 829-6796. 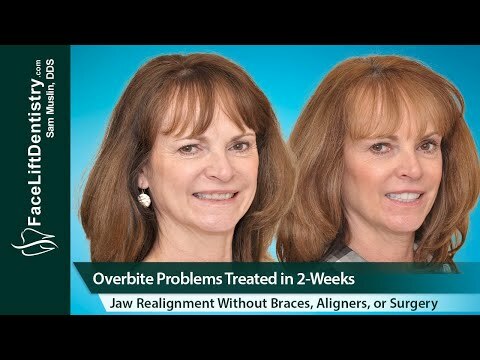 High-Tech Overbite Correction with the non-surgical Face Lift Dentistry Method.